Senna tea is a powerful natural laxative, which is very effective and efficient for problems with constipation; it regulates digestion in a best possible way and it solves our problems with constipation. In recent years, this beverage is increasingly attracting nutritionists and dieticians, because it speeds up the metabolism and contributes significantly to weight loss. However the senna herb must be properly dosed, because if it is used continuously for more than 14 days it can cause side effects that are not harmless. Severe liver damage is possible due to misuse of this product. Therefore, it is necessary to consult with a phytotherapist or doctor prior to using any of the products in the form of tea, tablet, capsule, in order to avoid these side-effects. Senna herb has a Latin name Cassia Angustifolia; it is a semi-shrub up to 2 meters high. The leaves are twisted, narrow, pointed, and almost sedentary. The fruit is oval, slightly bent upwards and up to 6 inches long containing 5-7 flattened seeds. It belongs to the family of legumes and is spread throughout north eastern Africa and the Middle East where it grows as a wild herb. In our region it is not growing, because it cannot succeed in areas with temperatures lower than 10 degrees. Certain species of this herb can succeed in America, where it is known that the senna tea has been used as a laxative in the past by American Indians. Did you know that the ancient Chinese said that regular bowel movements are as important as breathing? It must be in the proper rhythm, regular and in a way it symbolizes the constant discharge of everything that is superfluous in your life, and for this purpose the senna tea was used against the constipation. Indeed colon is much more than a hollow body with a not-so-favourite content, even some drugs take effect in the process of digestion, it all depends on the liver. Modern science gives more and more attention to this microbial organ, as it was called, because it has an invaluable role in the development and maintenance of a healthy immune response of the whole body. Not surprisingly, the human fascination with medicinal plants which normalize the rhythm of emptying the colon has always been there and the most popular among them is the senna tea, to which we dedicate this article. Senna tea is the most famous product of this herb for which we use leaves, which must be mature, dry and chopped. It is a proven remedy for colon cleansing, a remarkable natural laxative that speeds up the metabolism and helps with weight loss. In medicinal purposes leaves and pods are only used as they contain a well-known group of natural chemical compounds called anthraquinones, or compounds antakinona. The main compounds are senzoids A and B, which can be found in the plant. Active ingredients of senna leaves have an effect on nerve endings on the walls of the colon, enhancing peristalsis, allowing easier passage of food and they have a laxative effect. Senna tea helps better digestion, prevents constipation and bowel laziness (a more common disorder in the modern age). With these problems it is very important to completely adapt the diet, it is desirable to eat high-fibre foods, get enough exercise, be active and intake larger quantities of various fluids (but not alcoholic and soft drinks). 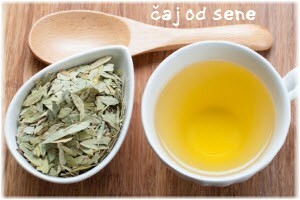 The senna tea is not recommended during pregnancy and should not be used by children under the age of 10. Lactating women should also avoid it, and people with chronic diseases of the stomach and intestines. Senna tea; how to prepare and properly use it. From the leaves of the tea take one large tablespoon (about 10 grams) of dried and chopped leaves and pour a full cup of boiling water over it. Stir it often and twenty minutes later filter it and drink. A similar but less effective than a senna tea are green beans. Always prepare a fresh beverage. To completely recover it is best to drink the senna tea after it has rested for a good 2 to 3 hours (or more if necessary), then you need to filter it very well and drink before bedtime. You can cook it in the morning and drink it only in the evening before going to bed. This will make spasms in the stomach and intestines much rarer and healing of the digestive tract will be successful. After establishing a normal function of the bowels the usage of senna tea should stop, until the next constipation occurs. This drink has a pleasant taste that you will certainly like. You always need to use the same preparations in order to know exactly the required dose and thus avoid unnecessary side effects. Senna tea is dosed at approximately 0.75 g per day (the amount of dried leaves) in adults. If we want to get a milder laxative then combine senna with other tea mixtures, the most famous mix is the one with the coriander. Does senna tea cause side effects? Senna tea should not be taken when it comes to inflammatory bowel disease (ulcerative colitis, etc.) because long-term therapy develops tolerance – because our intestines get used to a certain amount, and then we need to keep increasing the dosage to achieve the effect, which is not good. Senna herb also causes a drop in blood pressure, and is extremely dangerous for heart patients. This is a great example of how ignorance and lack of knowledge in herbal medicine can affect our overall health. Namely, in addition to its healing properties, which are exceptional, if senna herb is not dosed properly there are numerous side effects such as severe nausea accompanied by vomiting, severe pains and stomach cramps, inflammatory bowel disease, gastrointestinal bad work tract, damage to the walls of the intestines, cramping fingers and toes, depending on the dosage. If you plan to lose weight and you heard that senna herb can help in this, the experiences of participants are positive, but it brings certain risks with it. Where to buy senna tea and what is the price in the stores? Our recommendation is that that you prepare the senna tea yourself, according to the recipes that we have provided in this article. Of course, be sure to consult your physician before using this beverage and listen to his advice about dosing. Price varies depending on the manufacturer but if you are buying always take it fresh in herbal pharmacies. Avoid filter bags, it is just not it, this applies to any medicinal tea. The product can be found on the Internet so you can order from your chair. Also you can get the so-called senna dice for better digestion which contain the leaf of senna, dried figs, prunes etc. This is a good product, but do not take it on your own initiative without prior consultation. If you have problems with constipation start with lower doses of this beverage, and when you find out what amounts provide results stop there, do not overdo it. Most importantly, as soon as you achieve optimal efficiency, stop using senna tea, in order not to develop tolerance towards it. In the event that you get swollen lips, tongue, salivary glands after immediate consumption stop taking this beverage and immediately contact your doctor.